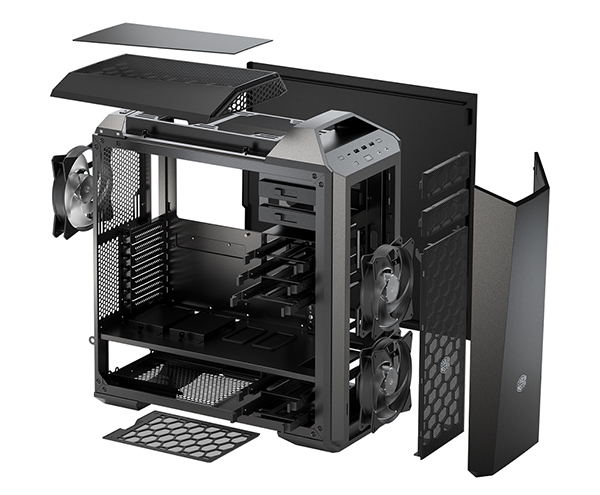 Cooler Master is back at CES with a range of new products, including the MasterCase Maker 5, a modular chassis that allows you to upgrade or swap out the individual parts according to your needs. The case is actually part of what Cooler Master calls its Maker Ecosystem, a range of products designed to enable enthusiasts to build their very own version of the ultimate PC. In addition to the MasterCase Maker 5, the company also announced the MasterAir Maker 8 and MasterWatt Maker 1200, a high-end air cooler and power supply. The MasterCase Maker 5 is the latest addition to Coolet Master’s MasterCase series that utilizes its FreeForm modular system, which allows users to easily customize the case’s looks and functions with different interior and exterior parts. We actually had some hands-on time with the earlier MasterCase 5 here, and compared to that case, the new Maker 5 features a few upgrades to help it stand out. It now has four USB ports on its front panel, one of which is a USB 3.0 Type-C port. Fan speed and LED control buttons have also been added to the I/O panel for easier control. The top panels have also been redesigned to better balance noise and airflow, and the mounting mechanism of the top and front panels has also been upgraded. Instead of brackets, they are now mounted on the case by a series of magnets, and can even be replaced with padded versions if you want a silent PC. And while we noted that the MasterCase 5 comes with just two pre-installed fans, the MasterCase Maker 5 ships with two 140mm fans and one Silencio LED 140mm fan in the rear. The front of the chassis can accommodate up to a 280mm radiator, and you’ll have space for up to six 140mm fans in total. Combine that with all the other customization options, and the result is a case that offers quite an impressive range of options for system builders with varying needs. 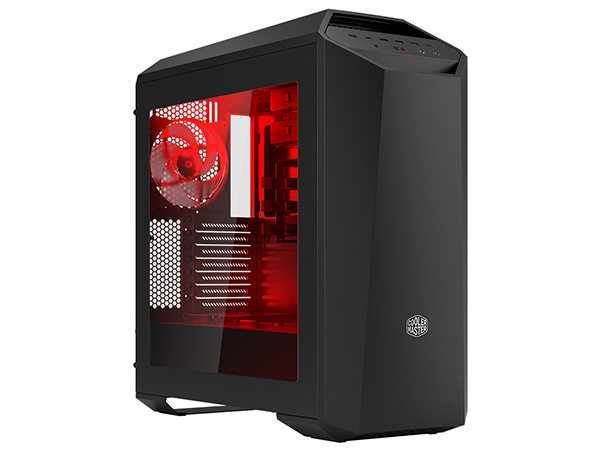 According to Cooler Master, the MasterAir Maker 8 is the first cooler to utilize its 3D Vapor Chamber (3DVC) technology. The company is claiming up to a 19 percent improvement in cooling compared to more traditional copper base coolers. To achieve this, the 3DVC design supposedly merges the heatsink’s horizontal base seamlessly with the heatpipes, and the greater cooling capacity will theoretically give overclockers slightly more headroom. The Maker part of the Maker 8 is found in the customizable top cover and bracket design. You have the option to either design your own, or choose from two bundled designs (a translucent cover or a clean and stylish aluminum plate). 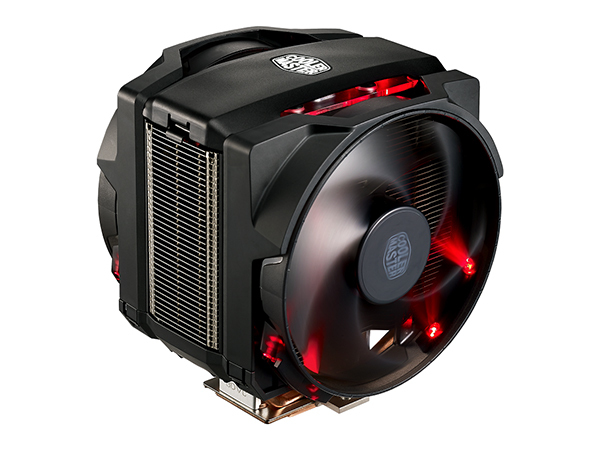 It comes with two 140mm Silencio FP fans with red LEDs. 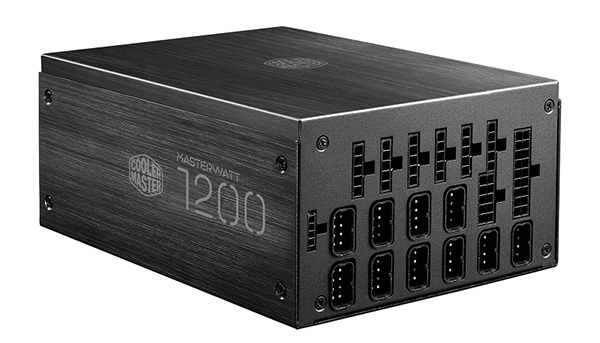 As far as power supplies go, the MasterWatt Maker 1200 is wired up to do quite a lot. The Titanium digital power supply has a 94 percent efficiency and features a 3D circuit design that allows nearly lossless efficiency as power flows through a shorter, uncluttered route. The integrated Silencio FP 135mm fan provides high static pressure to draw air through the honeycomb mesh, while still keeping fan vibration and power consumption down. Enthusiasts will be able to monitor digital readouts in real-time and control key power parameters via Bluetooth on Cooler Master’s dedicated iOS or Android app. The power supply is topped off with a brushed aluminium finish for a sleek, minimalistic look.